Liquid-cooled system maker Aquila has followd up its high performance computing systems with a ruggedized micro data center for edge computing, developed with a new partner, TAS Energy of Houston Texas. The eight foot square Herma system, which can include nearly 1500 compute cores, will be delivered in early 2017, and will include hard drives and solid state storage, Aquila announced at the SC16 supercomputing show in Salt Lake City this week. Bob Bolz, HPC and data center business development at Aquila told DCD back in September that the Aquarius liquid cooling system was a good fit for remotely managed edge data centers, as well as large centralized sites. That idea is being realised with TAS Energy, a maker of modular systems for data center and other applications. 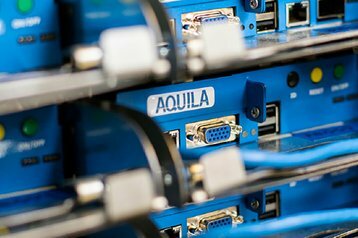 Aquila is providing liquid cooled compute, network and storage systems, and promises that Herma will be compact, efficient and offer high density and reliability. Herma will provide up to 1584 E5-2600V4 compute cores, 9.2 Tbyte of DDR4 RAM, and as much as 6.4 Pbyte of storage, with 200 Gbps bandwidth or more, in a system which will be tailored to specific customer requirements. The storage will be based on Scalable Informatics’ Unison hyperconverged systems which combine HDD and SSD capacity. “The Herma is a small data center that packs an incredible amount of liquid cooled computing and features state-of-the-art storage and network bandwidth based on highly reliable and well-understood HPC computer, storage, and network architecture,” said Bolz. The system will reduce heat output by as much as 30 percent, and could save up to 250,000kWh/year, he said. Edge data centers are increasingly important alongside large centralized facilities, as they provide storage and processing capability where it is needed, close to the expanding sources of data from the Internet of Things, and the ever growing demands for content by users. Edge data centers can eliminate bottlenecks and latency.